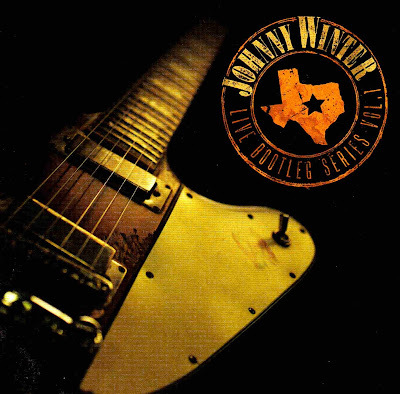 On the road: Johnny hits the House of Blues in New Orleans tonight before cruising into his native Lone Star State for a Friday gig in Houston and a Saturday performance in the border town of Texarkana. And if you live in the Northeast, look for Johnny and Edgar at the Starland Ballroom in Sayreville, New Jersey, on Friday, October 19. Above photo: Johnny and bassist Scott Spray tear it up B.B. King's in New York on September 15. Courtesy of our friend Neil Calandra. Keep checking back for more of Neil's shots. You can get a complete list of Johnny's tour dates right here. Johnny opens his vaults: Fasten your seatbelts, folks, and get ready for next Tuesday. Johnny and Friday Music are pleased to announce Live Bootleg Series Volume I, a spectacular late-Seventies live recording and the first installment in what promises to be a remarkable collection of rare and previously unreleased releases. 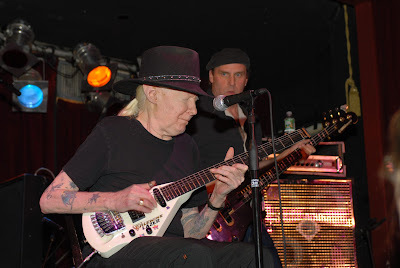 Produced by Johnny Winter with Joe Reagoso and Paul Nelson as executive producers, the performance finds Johnny in vintage form as he tears it up with bassist Jon Paris and drummer Robert Torello, a.k.a. Bobby T.
From his signature hair-raising scream of "A little rock and roll!" that introduces "Johnny B. Goode" to his stomping bonus track cover of Bobby Womack's R&B classic "It's All Over Now," this musical journey is one of blues and rock, heart and soul... These priceless, previously unreleased live recordings only further serve to fill in the gaps of a legacy that continues to be added to with every passing show and recording. Tracks include "Johnny B. Goode," "Messin' With the Kid," "Help Me," "Hideaway," "Come On In My Kitchen," "Rollin' and Tumblin'," "Stranger," "Jumpin' Jack Flash," "Bonie Maronie" and "It's All Over Now." On the Web: For a taste of life on the road with Johnny, click here. And also: Got photos? Some good ones here. And last but not least: If you missed Johnny's electrifying performance at Crossroads in late July, never fear -- you can own it this fall. Looks like the DVD issue of this event is due in November.